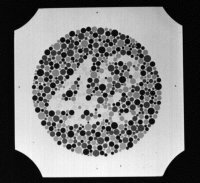 Charts for testing colour vision on which are printed dots of various colours, brightness, saturation and sizes, arranged so that the dots of similar colour form a figure (a letter, a numeral, a geometrical shape or winding path) among a background of dots of another colour. The colours of the figure and the background correspond to the confusion colours of the various types of anomalous colour vision. A dichromat or an anomalous trichromat has difficulty in perceiving the pattern because it is distinguishable from the background only by its difference in hue. There are many different sets of such plates, some using figures (circles, crosses or triangles) such as the AO, HRR plates, or numbers or lines such as those of Ishihara (Fig. P13) and Dvorine, or five spots such as the City University colour vision test, or the Lanthony tritan album, which consists of a square matrix of grey dots in which one corner on each plate contains blue-purple dots of different saturation and the subject has to identify the corner. See confusion colours; defective colour vision; Macbeth lamp; Farnsworth test; City University colour vision test. The HRR test is intended to identify and grade the severity of congenital protan, deutan and tritan deficiency. 20) When a criterion of two or more errors on the screening plates was used to indicate failure, the sensitivity of the Richmond HRR test has been reported to be 100% and the specificity to be 96%.